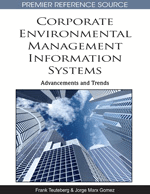 Recently, there has been increasing recognition that computer-based information systems should better support corporate sustainability management. New administrative approaches, e.g. in the field of emission trading, and recommendations, for instance regarding carbon footprints of products, require a new type of information systems in companies. These new components can be called corporate environmental management information systems (CEMIS). What is the purpose of these systems? They should provide the required information for environmental or sustainability management. But what is the idea behind? What is the guiding principle of these systems? This chapter discusses efficiency as a guiding principle of CEMIS. It helps to understand better basic methodologies like life cycle assessment, and it provides presuppositional knowledge for the challenge of introducing these information instruments. The introduction of scientific management at Bethlehem Steel Company stands for Taylor’s philosophy: Main purpose of scientific management, and therefore of appropriate management information systems, is to increase efficiency. Taylor cited in the introduction of his book the former US president Roosevelt: “The conservation of our national resources is only preliminary to the larger question of national efficiency” (Taylor, 1911, p. 7). Today, Taylor is regarded as one of the most important representatives of the so-called efficiency movement in the early 1900s. As in the pig-iron handling example, efficiency can be defined as a relationship between positive outcomes and required effort. A typical form of efficiency is a ratio. Coelli et al. call the ratio “productivity” (Coelli et al., 2005, p. 3). The enumerator represents the outcomes, e.g. in terms of revenues for sold products, the denominator the effort. The effort can be quantified by costs. With regard to environmental protection and sustainability other indicators come into consideration, e.g. contributions to climate change or cumulative energy demand. Other variants of eco-efficiency could be environmental intensity of production, environmental improvement cost and environmental cost-effectiveness (Huppes & Ishikawa, 2005c, p. 45). Schaltegger et al. consider eco-efficiency as a basic strategy in sustainability management. They compare efficiency with other basic strategies: sufficiency: “When an individual has enough of something then demand ceases and unnecessary use of resources is curtailed” (Schaltegger et al., 2003, p. 25), and consistency: “a composition of matter streams and energy forms which is able to exist permanently in an industrial ecology” (Huber, 1998, p. 27, cited and translated by Schaltegger et al., 2003, p. 26). In case of pig-iron handling the information system was fairly simple. Taylor's insights were based on investigations and experiments (Taylor, 1911, p. 31), performed in company with a “young college graduate” and a stop-watch as an information instrument. Nowadays companies use more complex information systems and simulation tools. Nevertheless, these software systems have mainly the same purpose: they should help to discover inefficiency. Taylor's two pillars of information – investigations and experiments – are supported by different types of information systems. Nowadays, investigations in larger organizations are based on enterprise resource planning systems (ERP systems). The ERP systems provide routinely generated information, whereas experiments can be performed using software tools, for example simulation tools. The purpose of experiments is to find and to enforce standards like Taylor’s adaption of task work for pig-iron handling at Bethlehem Steel Company. The specification of processes, work flows and economic incentives should establish an adaptive control system. Ideally, such a system does not require further investigations and control at regular intervals.